This sweet American Pit Bull Terrier named Harley doesn’t need any jokers, but she does need a loving, active family to love and play with her (submitted photo). 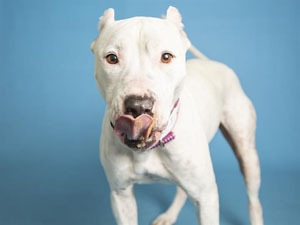 As beautiful on the outside as she is on the inside, sweet Harley is a 5-year-old American Pit Bull Terrier who was brought to the Arizona Humane Society bleeding and injured. A common side effect from not being spayed, she also had mammary masses that needed to be cared for in AHS’ Second Chance Animal Trauma Hospital. Now that she is all healthy, Harley has tons of energy and thinks running around the yard is the best! It is also easy to see that her favorite thing to do is give hugs and kisses while showing off the cutest smile. Visit adorable Harley at the Arizona Humane Society’s Sunnyslope location off of 13th Avenue and Hatcher Road. Her adoption fee is $135 and includes her spay surgery, microchip and vaccinations. For more information, call 602-997-7585 and ask for animal number 598115, or visit www.azhumane.org/adopt to see all animals available for adoption right now.